SOJA performs in Preston Auditorium. Courtney Earll | The Tartan. Feel-good words, positive vibes and sweet tunes filled Preston Hall this past Wednesday night. RSPaCE hosted its first spring concert with The Movement as the opening act for Arlington Va. headliners, SOJA. Students, anxiously holding their tickets, made multiple lines outside Preston Hall to go through security into the Bondurant Auditorium to grab a seat or standing spot. 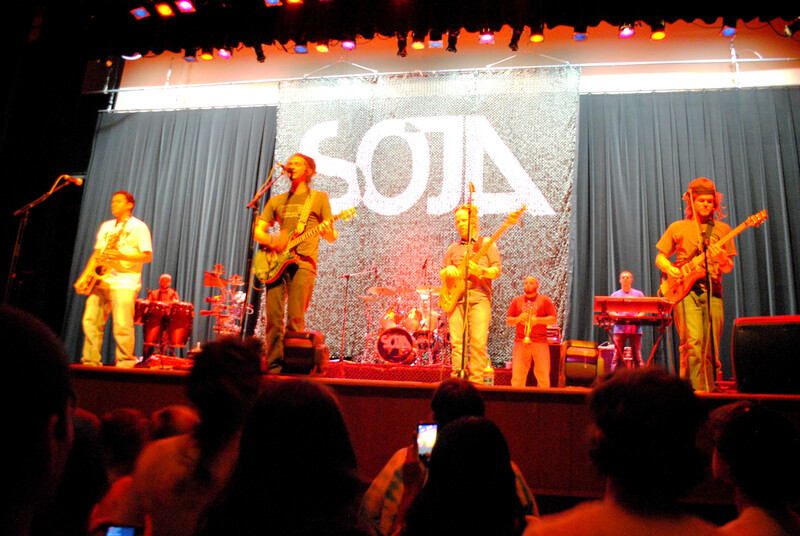 Many sported SOJA merchandise like hats, shirts and wristbands. There were a few people sporting The Movement gear sprinkled throughout the crowd. The crowd conversed loudly and wiggled around eagerly for the 8 p.m. show time to come around. The Movement is a rock infused reggae band originally from Columbia, South Carolina that came together in 2004. The group was originally a trio and succeeded in putting out a successful first album, On Your Feet. After some changes to the band’s member line up and joining forces with a new producer in Philadelphia, The Movement was ready to make their second studio album. Set Sail has given the band exactly what artists strive for; more exposure and a bigger following. Josh Swain and Jordan Miller, the two founding members, bring diversity to their reggae music through their interests in different artists such as OutKast, The Pixies, Norah Jones, etc. SOJA has a longtime history between its band members. Front man vocalist/guitarist Jacob Hemphill and bassist Bobby Lee met in the first grade. The pair would meet the remainder of the band in middle and high school. Only three years after forming SOJA, they released their first album, a self-titled EP, Soldiers of Jah Army. Their first full-length album would come two years later, and the second album would come four years later after replacing a band member in 2003. Those imaginary borders were brought down that night in Preston Hall. Opening with their first track off of their new album Strength to Survive, “Mentality” entranced the crowd to prepare them for a night of straight jamming. SOJA performed an 18-track set, two of those songs being a part of their encore. The energy they put into playing signature songs like “You Don’t Know Me,” “Rest of My Life” and “You and Me,” was contagious. Everyone in the auditorium was moving. Throughout the show, Hemphill wrote a modest grin on his face. It was obvious that these were just a group of good friends who loved playing together. Hemphill shared a few words with the crowd between songs. “Radford, thank you very much,” said Hemphill. “You know in the history of SOJA, we’ve never been here.” He said with a laugh, “My sister went to Radford!” And of course, that drove RU crazy and everyone cheered. After sixteen songs, the band exited the stage as if they were done, even waving goodbye to the fans. Everyone in Preston began to chant, “encore, encore, encore,” and the band came out to play two more songs, one from Strength to Survive and the other from their 2006 album, Get Wiser. The Movement and SOJA set the bar high for the next spring concert performer, Mac Miller. Their optimistic attitudes and grooving music had everyone leaving Preston Hall in higher spirits.